I couldn’t believe my eyes last night! One of the top trending topics on Twitter was #ripjackiechan. Had our Karate Kid Master actually “carked it”? The next step was to google Jackie Chan and BAM! 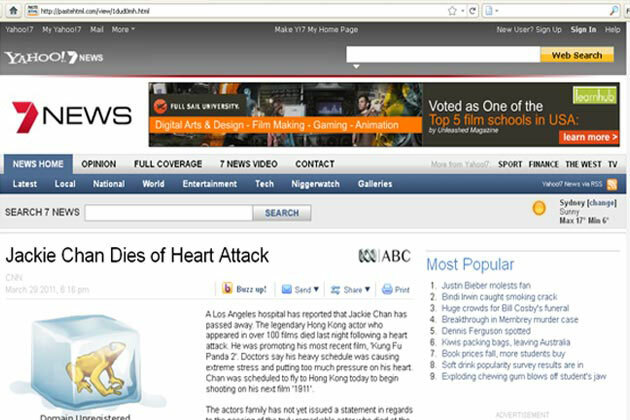 there were numerous articles reporting that Mr. Miyagi had died of a heart attack. The news swept like wildfire, retweets, posts and blogs were all spreading the word. RIP JACKIE CHAN. Here’s how it all started. At about 6.pm last night twitter user @forumn00b tweeted “Jackie Chan dies following heart attack, new detailshttp://bit.ly/h67UWD #RIPjackieChan“. Roughly two hours later twitter user @tweetmeme re-tweeted @forumn00b bogus death hoax. You see the thing is, until 7 pm only five tweeters had re-tweeted the message. It had barely started to trend. So what happened? @tweetmeme is a twitter account that tweets about twitter trends so its only natural that with 62482 followers #ripjackiechan went nuts. Absolutely nuts! It quickly outranked Lybia, Gaddafhi and Japan as the worlds most tweeted topic! (See below). The funny thing is, hes done it before. From somewhere in Australia @forumn00b has tried to fake the deaths of, Bill Cosby, Justin Bieber and Kate Miller-Heidke. So what was it that made this hoax more successful than any of the others? What caused this one to tip the scales? If you havn’t yet read “The Tipping Point” by Malcolm Gladwell you should. The book is about How Little Things Can Make a Big Difference. The book seeks to explain and describe the “mysterious” sociological changes that mark everyday life. As Gladwell states, “Ideas and products and messages and behaviors spread like viruses do.” Gladwell defines a tipping point as “the moment of critical mass, the threshold, the boiling point” (Wikipedia). What does all this mean? Well, in the 1980?s New York’s crime rates had risen to a violent level. Some of Brooklyn’s suburbs were so dangerous you couldn’t even walk outside at night. Amazingly with no warning, the crime rates just dropped. It had reached a critical mass, a tipping point. Something caused it to fall dramatically. By the end of the decade crimes committed on the subway had dropped by 75%. An unprecedented occurrence. New York didn’t have a “population transplant and no one went onto the streets to teach every would-be delinquent right from wrong”. How did it happen? Gladwell says, an epidemic is started by a tipping point. And for a tipping point to occur three things need to be in place. According to Gladwell the reason for the dramatic drop in crime was not because of Mayor Rudy Giuliani’s hardline policies but because of the “broken windows theory”. The Broken Windows Theory states that crime is an inevitable result of disorder. If a window is left broken & un-repaired people start to think that no one cares, and that no one is in charge. Soon another window will be broken and the anarchy from the buildings will start to spread to the streets on which it faces. In short, the environment in which an epidemic or sudden change occurs in, is pivotal to the creation of a tipping point. Now, lets consider the context (environment) in which @forumn00b started the #ripjackiechan epidemic. Well, thats pretty simple, TWITTER! Twitter is a contagiously informative tool, it can spread ideas like wildfire. The entire Twitter community is a sharing community. Tweeters are by default contributors. Five minor seemingly insignificant re-tweets ( before tweetmeme retweeted) were enough to get the tipping point moving. This law states ”The success of any kind of social epidemic is heavily dependent on the involvement of people with a particular and rare set of social gifts.” He goes on to qualify those types of people. Connectors – are those that ”link us up with the world … people with a special gift for bringing the world together.” They are “a handful of people with a truly extraordinary knack [… for] making friends and acquaintances”. These are those people who just know everyone. They make it their business to meet new people everyday, and often have an enormous social network (and address book). Mavens – are those types of people who just know lots of things. They can tell you authoritatively anything concerning any topic. They are information specialists. A Maven is someone who cant help himself to solve other peoples problems. As Gladwell states, “Mavens are really information brokers, sharing and trading what they know”. Salesman - are “persuaders”, charismatic people with powerful negotiation skills. We all know them and are often at the behest of their persuasion. Returning to the Mr. Han AKA Jackie Chan epidemic, who were the connectors, mavens and salesman? More so how are they defined in the context of Social Media. The Connector(s) – no prize for first guesses but @tweetmeme would be the connector. In a Social Media context connectors are those with “the most followers or friends”. @tweetmeme re-tweeted #ripjackiechan to over 62 000 people, theres no denying them as the connector. By in large though, everyone on Twitter on some level is a connector. The Maven – My guess would be @forumn00b. His tech savy brain produced that “unhosted HTML” thingimebob. He created authority and expert opinion with his post by providing a bogus link to the Yahoo7 news website. Maven’s are those who can provide a form of legitimacy to their posts with either a link, or simply by being an expert in their field in the real world e.g. Derryn Hinch @humanheadline @3AW693 and are ready and willing to spew information at the drop of a hat. The Salesman – Funnily enough, the salesman are those who re-tweeted @tweetmeme re-tweet (thats alot tweet tweet tweet). Thats you and me. Anyone who tweeted (and perhaps believed) that Jackie Chan had in fact died. We effectively sold it to our friends and family and anyone else that was on our followers list. The specific content of a message that renders its impact memorable. 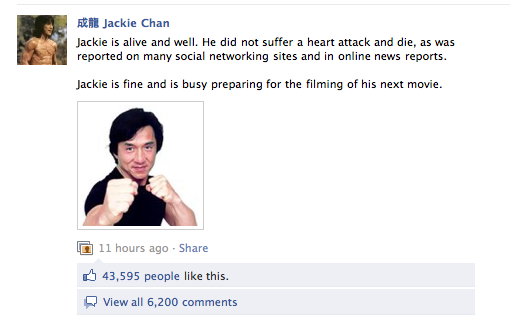 OMG Jackie Chan died. Well thats memorable! Everybody’s ears open up when a celebrity “dies”. So next time you try and start a social media epidemic think about Gladwell, and tweet responsibly. If you would ever like to submit a guest post, contact us.